Killed by lightning – again? 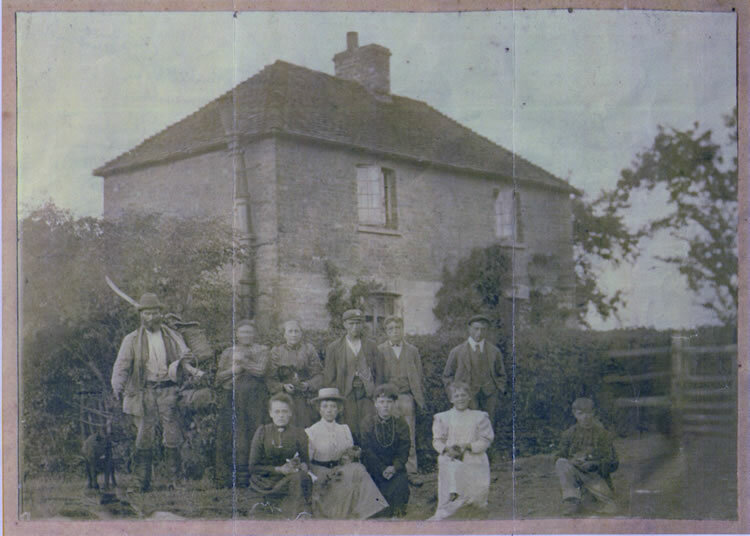 The Lucas family outside their house, Rusketts (long since demolished) in Lower Haysden in about 1900. John Lucas, a farm worker and gamekeeper, is on the left (b. 13 April 1851 in Leigh), his wife Elizabeth and another older lady are next to him.The others, their surviving children, include Susan (b. 1879), Lucy (b. 1880), John (b. 1881), Henry (b. 1882), Joseph (b. 1886), Simeon (b. 1888) and Victoria (b. 1889). In the 1901 census all the boys were recorded as ‘farm labourers’ and all the girls ‘servants’. John Lucas was said to have been killed when struck by lightning. We have recently received a request for information about the house that was thought to have been called ‘Rushes’, at Lower Haysden, still existed. The applicant’s grandmother had grown up there and though he had very little information he did enclose a copy of a photograph of the house, with the whole family (eleven people) outside it, which he said was called. Mr Lucas is dressed in his gamekeeper’s attire and with his dog The photograph did not resemble any existing houses in the Haysden area. However, a resident of Haysden had done some research into the history of that area. There had been a house just out of the hamlet, up the footpath/cycle track in the direction of Ensfield and Leigh; and there were two large fields on old maps which are shown with the name Rushets [not Rushes] on them. John Jarrett of Manor Farm who had lived in Haysden for over 70 years mentioned that when he was young, before the Second World War, he remembered that there was a very old lady that used to push an old pram from that direction to collect supplies from the pub, which in those days doubled as the local store. She was dressed from top to toe in black. The children were all frightened of her because they thought she was a witch! Looking back into the history of the applicant’s family, we think that they were connected with the very well-known Leigh brothers, Jack and Harry Lucas but are not quite sure how. The master of the house in the photograph is John Lucas who had been born in Leigh in 1851 and had married his wife, Elizabeth, in 1877. They had 12 children of whom seven were still alive at the time of the 1911 census. All seem to be shown in the photograph which probably dates to the turn of the century (in age order, Susan, Lucy, John, Henry, Joseph, Simeon and Victoria). Susan was Mr Johnson’s grandmother. She married a Mr Albert Randall and they had three children. The 1911 census shows that all the Lucas children except Simeon had left Rushets but that three grandchildren, Reginald (8), Ruby (7) and Dorothy (4), all with the surname Randall, are living in the house. Mr Johnson says that Susan, the children’s mother, had died of TB in 1908 which was why they were being brought up by their grandparents, John and Elizabeth Lucas. The applicant told us that the family were always told that John Lucas died after being struck by lighting – perhaps a first – if a very sad one – in Leigh? Further to the above article written for the Parish Magazine in January 2010, a descendant of John Lucas had written to us and had said that the family were always told that John Lucas had died after being struck by lightning. John Lucas and his family had lived at Rushetts, Haysden. On reflection we were not told that the death had taken place at Lower Haysden, so our article was incorrectly titled. Also we had not been given a date for John Lucas’s death or a copy of a Death Certificate to prove cause of death. But family stories are sometimes correct, though often incorrect, yet occasionally contain an element of truth. However, we know that John Lucas had died after the 1911 census, as he and his family were still living at Rushetts at the time of the 1911 census. The Civil Registration indexes indicate only one John Lucas whose death is registered at Tonbridge (the district for Haysden) and who would have been born in about 1851: this John Lucas’s death was registered in September 1925. But with the addition of British Newspapers now available on the FindmyPast website, I had hoped it might have been possible to find out – after all such a rare incident would surely have been reported by the local press – and the Kent & Sussex Courier (1873-1939) has been scanned and is available to search at the website. I therefore put the name of John Lucas into the search facility – but there were too many hits; so I decided to put the word “lightning” into the search facility and thought I had struck lucky: there was an article in the Kent & Sussex Courier – however, for September 1905 – namely 1 September 1905: and we know John Lucas was still alive in 1911. The article was headed “Killed by Lightning: Unknown Man Struck at Leigh – His Wish for death Granted”. It was not John Lucas – we do not know who he was – however, I thought that perhaps I had found that “element of truth” with the mention of an Ernest Lucas, gardener to Mr Alfred Paget Hedges of Upper Kennards, who had been at Pryce’s Farm on that day. So perhaps Ernest Lucas, having been able to report on the event, was the reason the story had been passed down the family. Yet to date I have not been able to find the link between Ernest Lucas and John Lucas with any accuracy, although there is a chance Ernest may have been a nephew to John through John’s brother William: but the census records alone are unable to show this conclusively – and there are a lot of Lucases in the Leigh and Tonbridge area at the time, many with similar Christian names. Further research and, of course, expense would be needed to try and trace through the many “Lucases” named in the records. That being said, being struck by lightning is a rare event – being killed even rarer – and more than one such incident in the Leigh area perhaps rarer still. The Kent & Sussex Courier only recorded that one event in 1905; surely it would have recorded an event in 1925 if John Lucas had been struck. But there is nothing in 1925 for the word “lightning”, or the name “John Lucas”. The Tornado & Storm Research Organization website gives some statistics on lightning deaths in Britain. Known as “TORRO”, the organization has developed a database of lightning impacts in the British Isles. It also states that lightning fatalities have been recorded on Death Certificates in England and Wales since 1852, so if John Lucas had died from a lightning strike it would have been recorded as such. According to TORRO, the number of people killed by lightning has been falling: for the period 1852-1899 the average annual death rate was 19; for the period 1900-1949 the average annual death rate was 12; and 1950-1999 this had fallen to 5 – despite an increasing population. Among the reasons for the fall in numbers are fewer people working outdoors, people working in safer conditions and better awareness of the dangers. Reproduced below is the Kent & Sussex Courier item for Friday 1 September 1905. Mr Thomas Buss, Coroner for the Division, held an inquest at the Fleur de Lys, Leigh, on Wednesday, on the body of an unknown man, a tramp, but a man of gentlemanly appearance and about fifty years of age, who was struck dead by lightning while standing under an oak tree for shelter during the storm about mid-day on Monday. From the evidence appended it will be seen that the deceased, but a few minutes before his death, had said he might just as well be dead, to which his companion, whom he had only just causally picked up replied. “Don’t say that, mate”. Mr B W Baker was chosen foreman of the Jury. Thomas Flood, of no fixed abode, labourer, said he did not know the deceased but came into contact with him just outside Tonbridge, on Monday. Deceased was sitting on a seat and witness got into conversation with him. He did not tell witness anything about himself, but said he was seeking work. Just outside Leigh deceased went under a tree for shelter as there was a storm going on at the time. While standing there deceased said “I might just as well be dead as alive. There is nothing to live for in this life”. Witness said. “Don’t say that mate”. They were then struck, and witness cried out “Oh, Oh, Oh”. They dropped down together. The stroke affected witness’s legs, the back of his head and forehead. After the stroke he put his hand over deceased’s mouth and found he was quite dead. Witness hailed a man who was passed with a cart. Deceased’s coat work burnt at the shoulder. The tree was also struck. Deceased was trying to get a job hopping. Samuel Hawkins, second coachman to Mr S Hope Morley, JP, DL of Hall Place Leigh said he passed just after the men were struck. They were lying about ten or twelve yards off the road, under some trees between Cinder Hill and Penshurst Bridge. One man was lying down and the other struggling out of the hedge to attract witness’s attention. Witness at once went to the police and got help. By the Foreman: He could not get off the carriage at once, as the horse was restive. Ernest Lucas, gardener to Mr Alfred Paget Hedges, of Upper Kennards, Leigh, said he was at Pryce’s Farm at a fire on the day in question, and on receiving information of the two men having been struck, witness and others went to the spot where they saw the men lying under the trees. Deceased was at that time dead, and lying under the oak tree. Witness assisted in his removal to the Fleur de Lys. He noticed that the shoulder of the deceased’s coat was burnt. PC Post said he was called to where deceased was lying and found him dead. From his shoulder down to his shoes his clothes were singed. On searching him, witness and PC Mayhow found no money and nothing to assist in his identification. In his pockets were two knives and several empty confectioners’ bags, bearing addresses in different parts of the country. His face had been photographed and a description circulated, but so far they had not received anything whereby they could trace who he was. The tree under which deceased stood was struck right down to the bottom. One knife, a steel one, was in his right hand pocket and caused the lightening to divert across the body, and to go down the left leg, as well as the right. (The knife produced and tested was found to be magnetized). Dr Frank Fraser, MD., CM., of Park House Leigh stated that on Monday August 28th a message from the police was received asking him to call at the fleur de Lys, to see two men, who had been struck with lightning. On his return home, at 2pm, he went there and found one man dead, and the other recovering from shock. On examining the deceased, he found him quite dead. He was about 50 years of age, with dark hair, tinged with grey, having hair, beard, moustache and eyebrows of same colour. His features were regular, yes hazel colour, with the pupils slightly dilated, stature about 5ft 6in and the body fairly well nourished. On examining the body he noticed that the hair above the right ear was singed, and a livid mark about an inch in width extended from behind the right ear, down to the right shoulder blade, where it extended to about 4 ins in width, the skin at this site being lacerated in every direction. From the shoulder blade, the mark extended to the right groin, where it divided and went down on the inner side of each leg, reaching to the second toe on the upper side of right foot and the inner side of ankle of left leg. This mark had the appearance of a line drawn by a red hot poker, scorching the skin and hair as it proceeded. The clothes were burnt and singed. Above the right ankle, and on a level with where the margin of the right boot would reach, there were several little punctured wounds in the line of the mark. The clothes were examined and were found torn in the line of the mark, likewise the boots. By order of the Coroner, he made a post mortem examination on Tuesday and for purpose of identification, note was taken that there were no marks or scars on the skin, other than that referred to except vaccination (not recent) scars. The skin on both hands was soft and delicate showing no signs of work, but there was a small corn on the inner side of each thumb, as one observes in gardeners and others from the use of spade or hoe, etc. As regards the teeth, on upper jaw, the left side incisor, canine, premolar and second molar were absent or broken off, and on the right side the second molar. In the lower jaw, the second and third molar on both sides were broken off. On further examination, 26 hours after death, rigidity of the body was found and the blood was fluid and had not clotted. The brain was found quite normal and not injured in any way, the heart, lungs, kidneys, liver and spleen were all normal, the stomach was empty and showed signs of an old inflammation. Death, he believed, was due to shock to the brain and nervous system, caused by lightning. This was similar to concussion. During the investigation a knife found in his right trouser pocket was found to be magnetized. This knife may have been the cause of the current dividing at the groin and descending both legs. He did not think the knife added to the man’s danger. It simply divided the current. It was always unsafe to get under a tree in a storm and the taller the tree the greater the danger. The Jury returned a verdict in accordance with the medical evidence, namely that death was due to shock caused by Lightning. The funeral of the deceased took place in Leigh Churchyard after the Inquest. Mr Faircloth had charge of the arrangements.